In the eyes of the world, Australia’s moral standing is inextricably connected to the plight of First Australians—the unhealthiest, the poorest, the least employed, the most illiterate, the worst housed, the least trained, the most imprisoned people in the land. Ted Egan AO is a writer, singer and former Administrator of the Northern Territory (2003 to 2007) and he is uniquely qualified to write this book. He has lived in the Northern Territory since 1950 and has worked for the Commonwealth Department of Aboriginal Affairs under both Liberal and Labor governments. He was a member of the first National Council for Aboriginal Reconciliation. The most delightful thing about the election of Barack Obama as President of the United States is that it allows the world – if it is ready – to put aside the issue of race as the means of establishing priorities, abilities, attitudes, policies, whatever. Yes, it is true that Mr Obama can be classified as “the first African American to be elected President” and yes, let every group in the world claim him as their own. The Kenyans, the Indonesians, the Hawaiians, the whites, the blacks, the browns, the yellows, for here is a chap who belongs equally to all of us. In genetic terms he is 50% Caucasian and 50% Kenyan – and who knows what other blood fractions could be established in his forbears – so what does his racial background matter? The crucial thing is that Barack Obama is obviously, genetically, physically and socially, well-bred and good value. He carries the hopes of the world, he is a magnificent orator who has taken huge strides on the road to this great appointment. The challenge is for all of us to use Mr Obama as the model to create the wherewithal to enable every child born on this planet to overcome barriers based on caste, creed, race or gender, free to aspire to the highest levels of achievement possible. 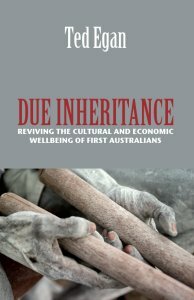 This book of mine – Due Inheritance – is, as stated on page 1, a cry for help, an attempt to take our First Australians out of that imposed category of perceived inferiority that has prompted, since 1788, governments of all flavours to impose on them well-meaning but inevitably flawed policies. We must rid ourselves of the “one size fits all” attitudes that we constantly impose on Aboriginals and Torres Strait Islanders. We must establish, at birth, an individual file on every child born in this country and treat each child as an invaluable asset whose potential must be taken to full achievement. Especially we must do that in respect of every First Australian child. The file would contain all the boxes that must be ticked to ‘do an Obama’ on the child: to provide, on a considered, individual level, a safe and loving environment, good health, good education, employment prospects, freedom from persecution or discrimination, maximum opportunity for a fulfilled life. My book begins with a poignant comparison of the opportunities established 76 years ago, on the basis of race, to two Australians, Ted Egan and Uni Nambijinba – both born in the year 1932. Ted Egan was slotted, as an individual, into a whitefella system that eventually enabled him to achieve the highest position available in the Northern Territory, that of Administrator. Uni Nambijinba at birth was categorised as one of ‘the faceless blackfellas’; she had no status as an individual, she was subject to discriminatory legislation, her basic human rights were neglected to a deplorable level. The Australian system failed her in every respect possible: throughout her life she was poor, uneducated, illiterate, in bad health. I guess you could say she was lucky that she lived to 76, when the average life expectancy of an Aboriginal woman in Central Australia is probably below fifty years – but her quality of life in latter years was abysmal. I wanted Uni to be at the launch of my book, but she died two weeks ago. Along the way she was a wonderful, positive contributor to an Australia that knows so little about people like her. She worked hard in the whitefella world, found a compromise between her eminent status as a senior Warlpiri woman and an admirable Christian who never tasted alcohol. Wiyaripa Nambijinba. Nguladjugu. It is just not fair that, in Australia, we still have an inbuilt system that makes it so easy for some, so hard for others to achieve, largely because of attitudes about race. Particularly about race as it applies to our own First Australians. I urge you to read my book. I paint a dismal picture. On a personal level I am saddened by the fact that so many of my First Australian friends have died at what is an unacceptable age. I am appalled at the ongoing level of deterioration in Aboriginal society that is taking so many people, particularly young people and children, into a meaningless life, riddled by sickness, disease, poverty, illiteracy, inadequacy, disempowerment; a sterile life that consequentially leads them into anti-social attitudes, addictive behavioural patterns, hopelessness, welfare dependence and what, in places like Alice Springs, Palmerston and Casuarina, can only be called subsidised crime. Things will get much, much worse, unless some drastic action is taken by Australian society generally, mainly through the empowerment of First Australian leaders and putting aside some nonsensical practices that are flaunted as being positive policies. It is important that First Australian leaders of sufficient calibre are found and given the means to enable them to shoulder the immense burden of the rehabilitation of their people. There are some Aboriginals and Torres Strait Islanders who currently claim importance, and assume the status of leaders, who are in fact posers, only interested in the celebrity status lifestyle so easily accorded them by guilt-stricken governments and too many other Australian organisations and individuals who are happy to be compromised, blackmailed and blamed. Many too many white people are employed on Aboriginal communities and in jobs and capacities that should be filled by First Australians. It is a sad paradox that, at the same time, there are plenty of strong, principled, cultured First Australians whose voices and opinions are rarely if ever heard. (Some are in this room as I speak.) Let us recognise them, empower them and draw on their wisdom. Quickly. I am talking about a crisis that surrounds the world’s oldest surviving culture and languages. A culture in total jeopardy. Although many Aboriginal and Torres Strait people display immense talent, perseverance, tolerance and kindness, it is a pity that by and large, in this country, First Australians are not required to be good at anything any more. There seems a guilt-stricken, passive acceptance that Australia must forever have the majority of our First Australian citizens as welfare recipients: in a fashion, we are revisiting the Daisy Bates “smooth the dying pillow” ideology. The essential difference is that the First Australians are not dying out in the NT. Far from it. Despite the fact that life expectancy for them is considerably lower than for other Australians, the growth rate of First Australians in the NT is 15%, against 2.6% for other sections of society. Unless there is a major intake of population from other regions, that means there will be a First Australian majority in the Northern Territory population in the very near future. How positive will that be, in economic, social and cultural terms? How good do we look for the future? My book is a manifesto about culture primarily, but I progress – logically I hope – to issues relating to First Australian land, sea, dollars and cents, pride, morale, self-discipline, health, housing, employment and education. The book is not a shot at any particular government or individual within government, although I do say that in Aboriginal education we should go back to 1788 and start again; and I do query the motivation of the Howard government as it introduced Intervention. I support the notion of Intervention but wonder why it was necessary, why we as a nation took our foot off the accelerator thirty years ago. I don’t seek to mince words in this book and there is little doubt that I will cop some flak for some of my opinions. I’ll accept that but I will want to hear the range of alternative proposals advocated by my critics. (1) the establishment of a Register of the First Australians, organised and controlled by First Australians themselves, incorporating appropriate data necessary to conduct elections, appraise language and other strengths, and for any purpose deemed beneficial in recognising those people with real affinities dating pre-1788. (2) the election, via the Register, of the Academy of First Australians, comprising fifty (50) First Australians, over eighteen years of age, free from any criminal conviction, to be, as a body, the cultural authority of the First Australians and act in an advisory capacity to Federal Parliament on all matters of policy. The Academy would primarily play a cultural role, to preserve all aspects of traditional culture, especially the retention and rehabilitation of traditional languages and ceremonies. It is suggested that the Academy rather than government should be the body to negotiate land leases with traditional owners and shared responsibility agreements with First Australian communities. The Academy would be accorded true recognition and national respect as the elected nominees of all First Australians. Twenty five (25) members would be required to demonstrate fluency in a traditional Australian language as well as English. The other twenty-five (25) members would be elected from regional bodies throughout Australia. (3) the establishment of a once-only Future Fund, in an amount of $5 billion, as the Inheritance of the First Australians. $4.5 billion would be invested in bullet-proof investments to enable annual topping-up of the balance of $500,000,000 that would be distributed annually, at the behest of the Academy, for cultural and local government advancement of First Australians. There would be total accountability. (4) an individual appraisal of every First Australian from birth to death, to ensure that every opportunity is provided to enable each person to achieve full potential as a valued citizen of Australia. (5) the recognition of the land rights of every identifiable language group of First Australians, by the establishment of a home base in land terms, no matter how small that parcel of land might be. The symbolism is crucial. This was the basis of the land rights struggles of the 1960s. (6) procedures to require governments to stop fighting First Australians in land matters. Instead of appealing against decisions like Blue Mud Bay, government should seek to use such a decision as the means for wonderful co-operation with, in that case, the Yolngu. (7) a system to take out of our national vocabulary pejorative terms, based on perceived inferiority, like fringe dwellers, town campers and long grassers. I advocate the abandonment of all schemes to accommodate people so categorised in intolerable slum conditions not acceptable to other Australians. (8) a system that throws the problems of those people back to a traditional First Australian leadership for rehabilitation in their own traditional areas. This is not apartheid: this is caring for countrymen by countrymen. Again, it is what the land rights struggles of the 1960s were all about. (9) a system whereby all National Parks are placed under joint management of appropriate Commonwealth, State and Territory agencies, together with the Academy of First Australians. (10) a system to allow existing First Australian landowners the opportunity, if appropriate, simultaneously to have their land classified as National Parks, with all the obvious benefits. (11) a total review of all social service payments, especially Unemployment Benefit, as they relate to First Australians, with a view to establishing new national criteria concerning eligibility. (12) the presentation, via the Academy, of imaginative campaigns concerning attitudes to alcohol, particularly among First Australians. Click here to see the review by Nicolas Rothwell of The Australian. Click here to see the review by Kieran Finnane of the Alice Springs News.